Silverstone’s new SG07 is a monster of a small form factor case. The fascia may look very smart, but inside is where the killer features are. That’s a full ATX PSU in there. Why? Because the case supports GeForce GTX 480 and Radeon HD 5970 graphics cards – the full foot long versions. Silverstone say you can use your own PSU but have designed and will bundle a 600W 80Plus Bronze model that has specific cable lengths for use in the space constrained insides. There has been an extensive effort to make sure the graphics card does not overheat, with ducts and grills included in specific areas of the case to make sure enough cool air gets drawn in and the hot exhaust doesn’t get drawn back into the intake vents. Motherboard support is limited to mini-ITX now, as opposed to Silverstone's older SG SFF cases which were bigger and supported micro-ATX too. That’s fine though - if you've been following the site recently, you'll know there are several H55 mini-ITX boards about to hit the market, with a full set of features for a gaming PC such as a 16x PCI-E slot. 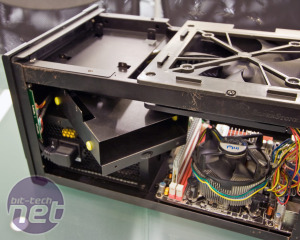 Opting for mini-ITX means Silverstone can keep the size of the SG07 down, too. 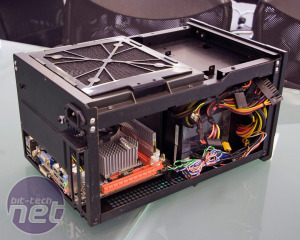 To cool this mini-beast, there's a huge 18cm fan in the roof – that’s bigger than the motherboard itself – that can be set to push 103CFM at 1,200RPM on its high setting or a quieter 700RPM on low setting, via a switch in the back of the case. The SG07 also supports two 2.5in SSDs plus one 3.5in drive, as well as a slim optical drive above. With a sturdy steel build it’s not that light fully laden, but then again what full gaming PC has ever been? However we’d have liked a handle option because it’s an ideal LAN PC. At an anticipated $180 in the States, or £130-150 in the UK, it's not set to be too pricey, considering it comes with the 600W PSU. 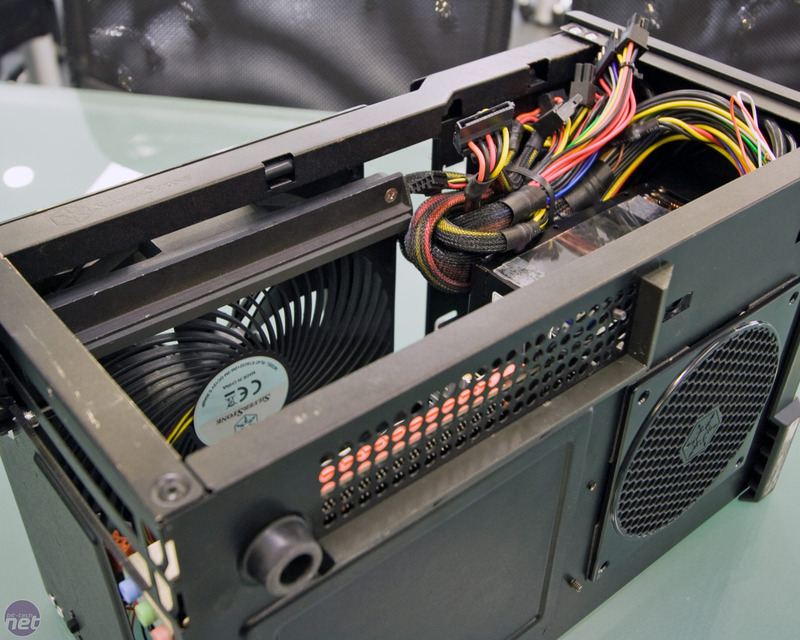 Are you an SFF enthusiast and do you fancy a mini-ITX upgrade for yourself? Let us know in the forums.